Prepare for compliments with our Chinese Shrimp Recipe! 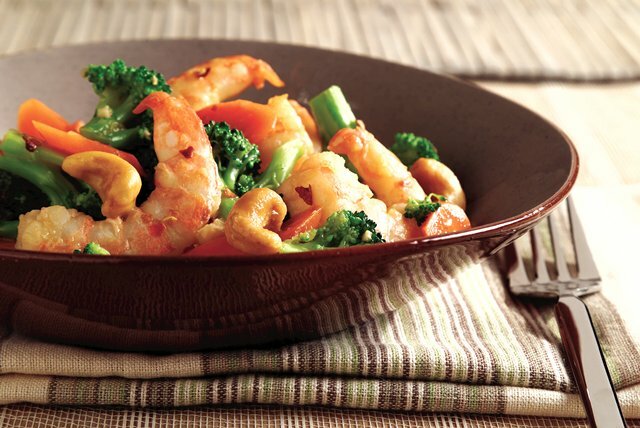 Gingerroot and garlic give this Chinese shrimp recipe terrific flavor and aroma. Toss shrimp with ginger and garlic. Refrigerate 1 hour. Meanwhile, mix teriyaki sauce, broth and crushed pepper until blended. Heat oil in large skillet. Add shrimp mixture; cook and stir 3 to 5 min. or until shrimp turn pink. Add teriyaki mixture, broccoli and carrots; stir. Cook until vegetables are crisp-tender, stirring frequently. Substitute 1 lb. boneless skinless chicken breasts, cut into bite size pieces, for the shrimp.